Dear dad, i couldn't imagine if you're not by our side all the time. I just wanna say thank you for brought me up into this world. Thank you for loving mum so much and loving your naughty daughters and your only son. Well, as the ancient malay proverb says, "lebih senang menjaga sekawanan lembu daripada menjaga seorang anak gadis". I'm afraid that i should agree with that. Yet, you're always patience with our 'perangai gila-gila'..hehe..knowing that these were part of our process of growing physically and mentally. 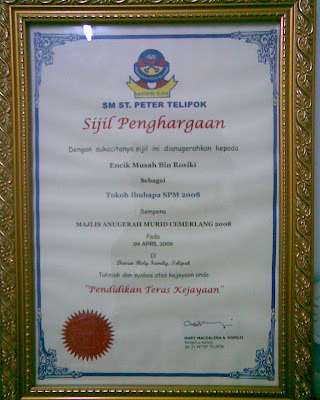 Oh yes, about the Appreciation Certificate "Tokoh Ibubapa SPM 2008", you deserved to have it together with Mom. Without dad and mum's support, Farahhannie (my younger sister) will not stands as she is now...zillion thanks to my beloved parents.